Hemochromatosis is a metabolic disorder that affects over 1 million Americans. It's real. It's common. It's genetic. Hemochromatosis is an iron disorder in which the body simply loads too much iron. This action is genetic and the excess iron, if left untreated, can damage joints, organs, and eventually be fatal. There are several types of hemochromatosis. Type 1, also called Classic Hemochromatosis (HHC), is a leading cause of iron overload disease. People with HHC (too much iron) absorb extra amounts of iron from the daily diet. The human body cannot rid itself of extra iron. Over time, these excesses build up in major organs such as the heart, liver, pancreas, joints, and pituitary. If the extra iron is not removed, these organs can become diseased. Untreated hemochromatosis can be fatal. Iron is an essential nutrient found in many foods. Iron carries oxygen (in hemoglobin) to all parts of the body. Normally, humans absorb about 8-10% of the iron in foods that they eat. People with hemochromatosis (too much iron) can absorb four times more iron than normal. Mismanaged iron in the brain has been observed in autopsies of people with neurodegenerative diseases: Alzheimer's, early onset Parkinson's, epilepsy, multiple sclerosis, and Huntington's disease. Caucasians are the people most at risk for the classic type of hemochromatosis. More than one million Americans have the genes for this type. However, there are other gene combinations that result in hemochromatosis regardless of a person's ethnicity. It is estimated that as much as or more than 16 million Americans have some degree of elevated iron and are at risk for the same diseases that occur in people with the untreated classic type: bone and joint disease, cirrhosis, liver cancer, diabetes, hypothyroidism, hypogonadism, infertility, impotence, depression, or premature death due to liver or heart failure. Chronic fatigue and joint pain are the most common complaints of people with hemochromatosis. For this reason, the complete diagnosis is often delayed because these two symptoms are commonly seen in other diseases. Pain in the knuckles of the pointer and middle finger, collectively called “The Iron Fist,” is the only sign or symptom specific to hemochromatosis. However, not everyone with HHC experiences the Iron Fist. When symptoms are associated with hemochromatosis, these usually begin in men in their late 20’s to early 30’s. In women, symptoms usually start about 10-15 years after they stop having a period due to menopause, birth control pills, or hysterectomy. Consider using our Symptoms Log to monitor your symptoms of hemochromatosis. Hemochromatosis can be overlooked by a doctor who is concentrating on treatment of diseases that are present in the patient. Many doctors still believe what they learned in medical school – that hemochromatosis is rare and only happens in older men. When hemochromatosis is discovered early and treated before organ damage can occur, a person can live a normal, healthy life. Any family practice physician is qualified to diagnose and order treatment for a hemochromatosis patient. What Iron Tests Determine Hemochromatosis? What tests are needed to obtain a diagnosis? There are 3 tests that together make up the Iron Panel Test. These tests look at serum ferritin, Total iron binding capacity, and serum iron. These tests need to be taken as a panel, not independently, to receive a comprehensive and accurate assessment of a potential Hemochromatosis diagnosis. This test is best conducted after fasting for at least three hours. Also, iron or vitamin C supplements should be discontinued at least three days before taking the test. Do not discontinue other medication unless your doctor tells you to. This test measures the amount of iron contained or stored in the body. Serum ferritin reference ranges are different for adults and children. For adults, the ideal range is 50-150 ng/ml. This test tells how well your body can bind to iron. Serum iron divided by TIBC x 100% gives you important information about the transferrin-iron saturation percentage (TS%). TS% is usually 25-35%; in some people with iron overload, the TS% is very high. There are other types of iron overload where the TS% is normal. In the past, liver biopsy was widely used to diagnose hemochromatosis. Today, liver biopsy is not necessary to diagnose the inherited form of HHC. DNA tests are available to determine if a person has genetic hemochromatosis. Learn more about genetics below. Genetic tests can confirm a diagnosis and help identify family members who are at risk for hemochromatosis. Most commonly, the genetic test is performed with a cheek swab. Type I hemochromatosis is caused by defects (mutations) in the HFE gene. HFE has many purposes, but one important role is that it helps to control the amount of iron that is absorbed from food. There are several known mutations in the HFE gene, but presently testing for only three is available: C282Y, H63D, and S65C. Everyone inherits two copies of HFE, one from Mom and one from Dad. When a person has one mutated copy, he or she is called a carrier or heterozygote. When a person has two of the same mutated copies, he or she is called a homozygote. When a person has two different – but mutated – copies, he or she is called a compound heterozygote. Genetics can be very difficult to understand at first. What is most important is that you know which gene combination causes the greatest known risk of loading iron. Risk can be modified by other genes, the environment, or unknown factors. Therefore, anyone with a mutated copy of HFE should periodically ask their doctor to check iron levels through hemoglobin, fasting serum iron, TIBC, and serum ferritin. It is very important to get iron levels down to normal. Therapeutic blood removal, or phlebotomy, is the most common means of iron reduction. Therapeutic phlebotomy (TP) is the same as regular blood donation but TP requires a doctor’s order (prescription). Regular blood donation can be done every 8 weeks. A person with severe iron overload may need to give blood as much as 8 times in a single month! The goal is to bring blood ferritin levels to an ideal range of 50-150ng/mL. Depending on the amount of iron overload at the time of diagnosis, reaching normal levels can require several phlebotomies. Serum ferritin drops about 30ng/mL with each full unit (500cc) of blood removed. When ferritin falls more rapidly following a phlebotomy, there is likely some other reason for the fast rate other than the blood donation. These reasons are specific to the individual but can include the presence of inflammation, changes in alcohol consumption, or changes to medication. Once iron levels reach normal, a person can begin maintenance therapy, which involves making a blood donation every 2 to 4 months for life. Some people may need to give blood more or less depending on what they eat and how quickly their body absorbs iron. The TS% and serum ferritin tests can be done periodically to help determine how often blood should be removed. When hemochromatosis is diagnosed early and treated before organs are damaged, a person can live a normal life expectancy. For people who have the disease at the time of diagnosis, life expectancy may be shortened depending upon the disease. If a person is diagnosed and treated before serum ferritin is above 1,000ng/mL the risk of cirrhosis or liver cancer is less than 1%. Humans consume two types of iron: heme and non-heme. Heme iron is the most easily absorbed form of iron. Highest in heme iron is red meat such as beef, venison, lamb, and buffalo. Additionally, blue fin tuna is higher in heme iron than most other types of fish. All meat and fish also contain non-heme iron, which is found mostly in vegetables, fruits, nuts, grains, and most over-the-counter iron supplements. Also, please consider purchasing our book, The Hemochromatosis Cookbook. It features dozens of recipes for the hemochromatosis patient and also makes a great gift! Hemochromatosis is believed to affect over 1 million Americans according to the Centers for Disease Control (CDC). This statistic means that 1-250 Americans have full-blown Hemochromatosis and 1-8 Americans are carriers for the genetic make-up. Below are video stories of patients that have immense experience with Hemochromatosis. The Man Who Turned Orange shown with permission by Discovery Health with a license obtained by Iron Disorders Institute for educational use. Keeping records can save lives. Use these helpful charts to manage your hemochromatosis. Feel free to download our forms and charts. They are designed to help you as a patient. 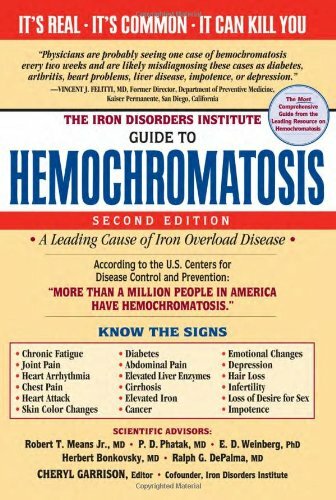 Each year the Iron Disorders Institute Scientific & Medical Advisory Board issues updated Physician Reference Charts, which contain the most current best practice guidelines for patients with hemochromatosis. by Iron Disorders Institute, a 501 c (3) non-profit agency.